Browse: Home » News » Will increase in COE supply further dampen premium prices? According to the statement made by the Land Transport Authority (LTA) on 12th July 2018, there will be a 12.5% increase in Certificates of Entitlement (COE) quota from August to October. We have already seen the last round of COE premiums ended at their lowest in 8 years. 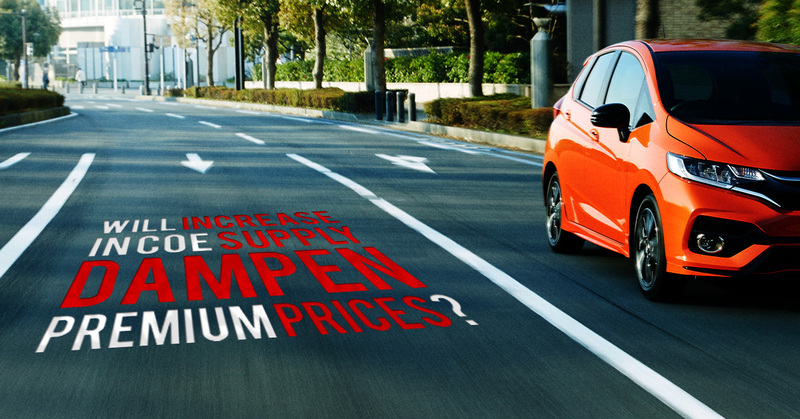 Will the increase in COE supply further dampen premium prices? While COE quota might seem to increase as a whole, the breakdown above showed clearly that for motorcars, only CAT A quota has increased. Many car buyers may think that CAT A COE premium will fall even further with increased quota. However, that might not be the case. This is because the recent fall in CAT A COE premium to $25,000 in the last round of bidding has resulted in customers rushing to showrooms in hope to get a good bargain for their new car. This causes an increase in demand for CAT A cars thus resulting in COE premium increase in the next few bidding rounds. Although the increase in quota might absorb some of the increment in CAT A premium, it would be unlikely that COE premium would fall further. It is expected that premiums would stay or end a bit higher in upcoming rounds. If you are considering to purchase a new car, wait no further. Now is probably the best time to shop around especially if you are looking to purchase a CAT A car. This is because the chance for COE to drop further for CAT A is slim due to increase in demand in this period. Cars & Stars is offering an attractive price package for CAT A cars. Honda Fit 1.3 GF is now selling at only $72,888. Visit our showroom to view the full collection of our cars at 50 Ubi Ave 3 #01-01/02 S(408866).